Leonard & Virginia Woolf. The Hogarth Press and the Networks of Modernism. Ed. 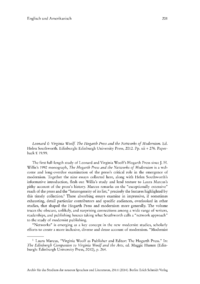 The first full-length study of Leonard and Virginia Woolfs Hogarth Press since J. H. Williss 1992 monograph, The Hogarth Press and the Networks of Modernism is a welcome and long-overdue examination of the presss critical role in the emergence of modernism. Together the nine essays collected here, along with Helen Southworths informative introduction, flesh out Williss study and lend texture to Laura Marcuss pithy account of the presss history. Marcus remarks on the exceptionally extensive reach of the press and the heterogeneity of its list, precisely the features highlighted by this timely collection. These absorbing essays examine in impressive, if sometimes exhausting, detail particular contributors and specific audiences, overlooked in other studies, that shaped the Hogarth Press and modernism more generally. The volume traces the obscure, unlikely, and surprising connections among a wide range of writers, readerships, and publishing houses taking what Southworth calls a network approach to the study of modernist publishing.